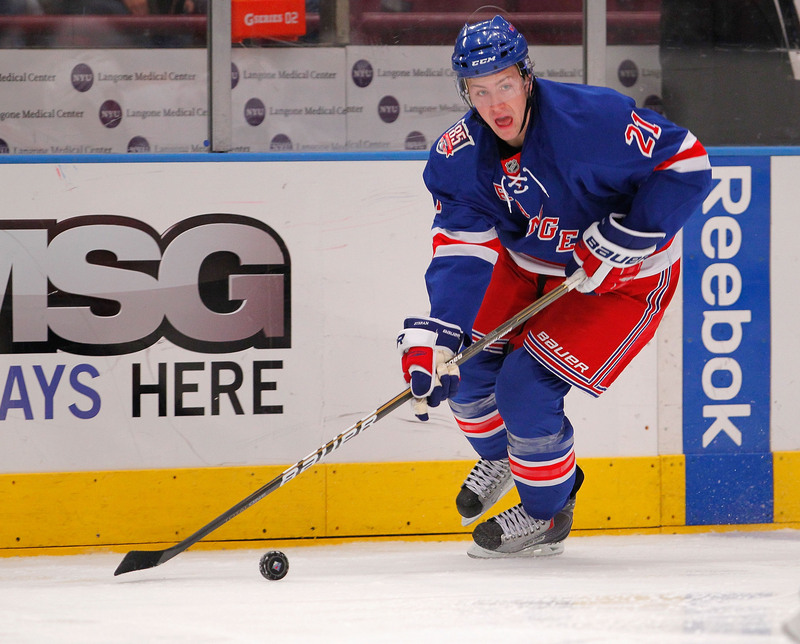 Chris Mueller has been reassigned to Hartford, meaning that Derek Stepan’s return is imminent. This afternoon, the New York Rangers reassigned forward Chris Mueller to the Hartford Wolf Pack, the Rangers’ AHL affiliate. Mueller was originally called up to help a depleted Rangers center group, most notable with the injury to Derek Stepan. In seven games with the Rangers, Mueller has scored once and picked up an assist, with both of those points coming against the New Jersey Devils on October 21st. Mueller spent a lot of time at center, filling in the fourth line position when Dominic Moore was moved up to the third line. Mueller also played on the wing position when platooning with Kevin Hayes on the fourth line. The reassignment of Chris Mueller has a few meanings outside of where he will be playing his next hockey game. Because the Rangers reassigned a center, it looks more and more likely that Derek Stepan will make his season debut on Saturday against the Toronto Maple Leafs. Stepan has been held out of the Rangers’ lineup due to a fractured fibula he suffered during a preseason conditioning drill. Last season, Stepan was the Rangers top line center, often playing in between Rick Nash and Chris Kreider. In 82 games, Stepan had 17 goals and 40 assists, totaling 57 points. He is also very versatile on the penalty kill and the power play, and should help both units upon his return. It is likely that he will return to that role if he plays on Saturday. Derek Stepan has been practicing with the Rangers in contact drills and practices, and there is a very good chance that he returns to the Rangers lineup this Saturday against the Maple Leafs. Mueller’s designation to Hartford also bodes well for rookies Kevin Hayes and Anthony Duclair. 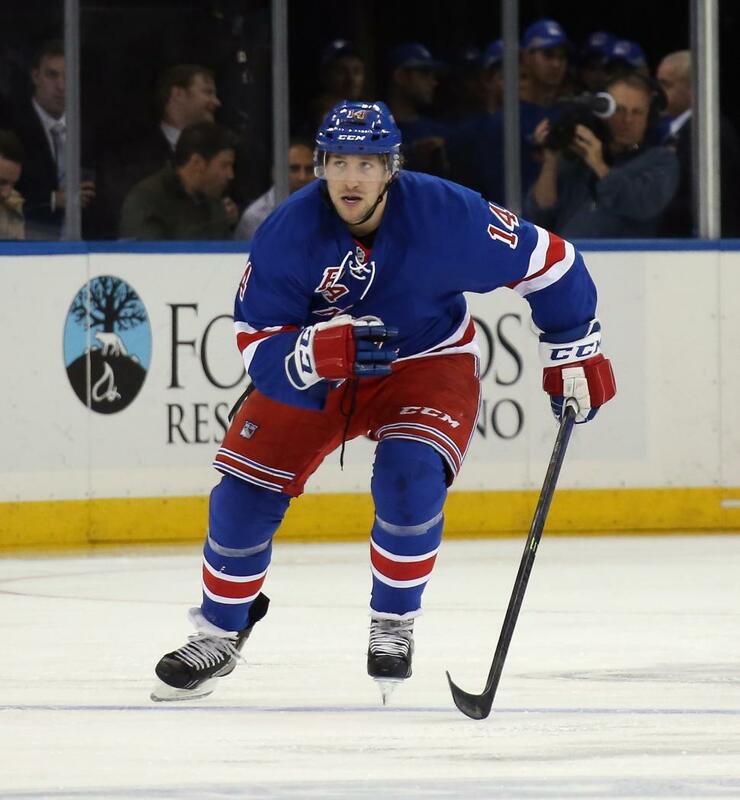 Kevin Hayes is also a center, and has been playing on the third line for most of the season. When Stepan returns, it is very likely that he may remain in the third line position. The speculation around Anthony Duclair was whether or not he would remain with the Rangers or go back to his junior hockey team, the Quebec Ramparts. Anthony Duclair has been very effective for the Rangers, scoring once and picking up five assists in 10 games. The news of Chris Mueller’s reassignment means the Anthony Duclair has a better chance of remaining with the Rangers. In 10 games, Duclair has one goal and 5 assists. Duclair’s speed fits perfectly into Alain Vingeault’s system, and he has been responsible on both sides of the puck, not really making many defensive errors or miscues. With Mueller in Hartford, it may mean that Duclair is more likely to keep his roster spot as well. Posted on November 6, 2014, in Rangers Updates and tagged Anthony Duclair, Chris Mueller, Chris Mueller reassigned, Derek Stepan, Derek Stepan return, Hartford Wolf Pack, Kevin Hayes, New York Rangers, NYR, Rangers, Rangerstown. Bookmark the permalink. Leave a comment.